While trying to access gotbackup from member`s area getting error "Username in use." 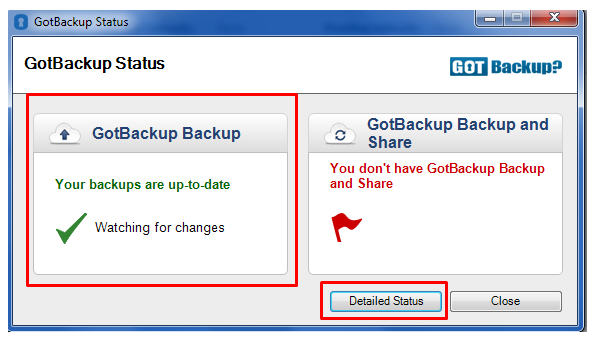 It seems there is an issue with creating an account in GotBackup Portal with your registered email. Please login to your member’s area and browse the following link to create your account in GotBackup Portal using a different email address. After installing GotBackup on my pc/mac I can’t login as the buttons are greyed out. It seems you are having another backup software running on his pc/mac. That can cause this issue. Turn the application off and re-try to login to Gotbackup desktop. Follow the steps listed: within System Preferences ---> Language & Region---> please add the English language on the list. Do not have to make English as a primary language, it must just be added on the list. My gotbackup portal shows 512Gb or 1Tb space only. I should get unlimited space as mentioned on the website. Please submit a ticket from your member’s area or contact us via live chat to resolve the issue. Yes you get 512GB of share space with GotBackup share package. But the Gotbackup drive on your computer will show space same as the primary partition of your computer. GotBackup is not allowing me to backup 2nd profile of my computer and says I can backup only 1 computer. GotBackup treats every user profile as a different computer. As if we allow same user/password combination to backup all profiles it may cause privacy issue. The files of 1 user profile will be visible to another in the portal. Gotbackup software crashes after sometime or during integrity check? It seems you are applying backup more than your pc resource can handle. You need to stop all backups (better reinstall) and schedule step by step instead of setting bulk at a time. It appears you selected a lot of data to backup at once causing the Gotbackup desktop client to crash. The desktop client is 32-bit and therefore inherits the memory limitations when processing data. To resolve this issue, we would recommend uninstalling/reinstalling the application then when selecting data for backup, to select just a few folders then monitor their upload via the Detailed Status screen. 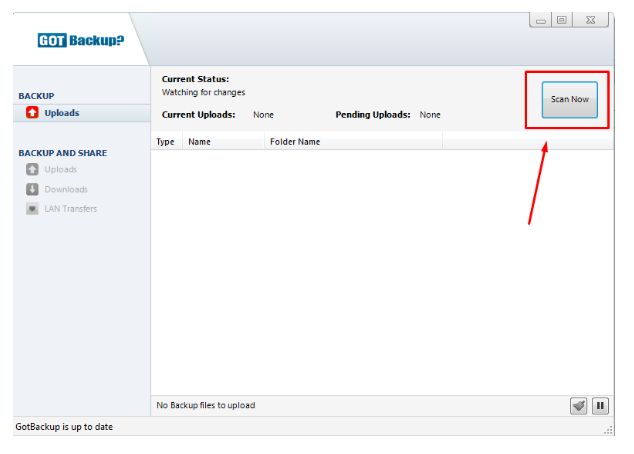 Once the upload is complete, they can select a few more folders for backup. Continuing in this fashion will allow your customer to complete the initial backup of their data. Once the initial backup is done there should be no problem to run the sync further. Why I cannot access Backup and Share in my members portal? Error: Backup and Share is currently disabled on this account. Please contact your service provider to activate. Please make sure that GotBackup application is running on your computer. Then open it and it will start the Gotbackup application on your computer. What do I do if Gotback doesn’t install? You do not need to worry about the threat warning as it is safe and secure. It is the program created by programmers with respective antivirus software which detects such tools as threats. If you still unable to install it then you can come on live chat so that we can assist you ahead. 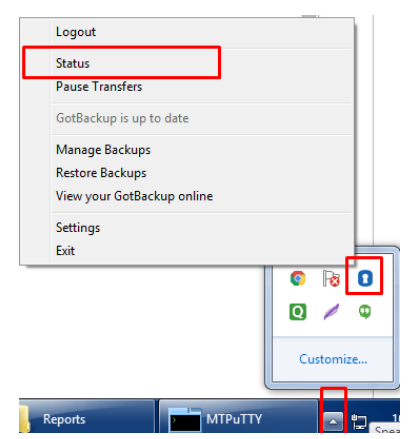 How to uninstall GotBackup desktop and install it again? Each installation of the Gotbackup client is seen by our servers as a new computer and therefore a new backup set will need to be created. In order to install the software again on this computer you will need to unlink the old backup from your account, you can do from the web portal and clicking on the X by the machine name on the Devices tab. By default the checkbox will be ticked to ensure that the files are kept on our servers. Once you've installed, the client would be able to connect without this error and create a new backup set. However, due to our file deduplication technology, files you have already uploaded would not need to be re-transmitted. Selected files would appear in the transfer queue and then appear to upload almost instantly provided you select the same data.